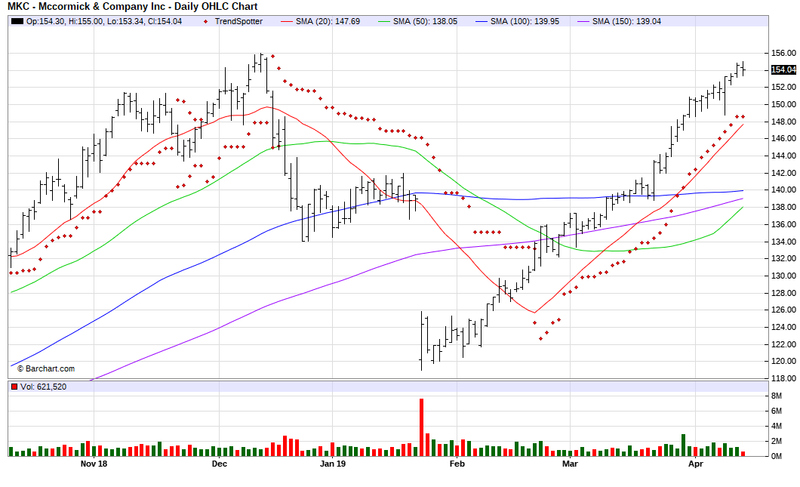 The Barchart Chart of the Day belongs to the diversified food company McCormick & Co (MKC). I found the stock using Barchart to screen for stock with a Weighted Alpha of at least 34.00+ and technical buy signals of over 80%. That narrowed the search down to 277 stocks. I then used the Flipchart feature to review the charts for consistent price appreciation. Since the Trend Spotter signaled a buy on 2/22 the stock gained 13.48%. McCormick & Company, Inc. is initiating a recall of products manufactured with HVP (hydrolyzed vegetable protein) supplied by Basic Food Flavors of Las Vegas, Nevada, because the ingredient has the potential to be contaminated with Salmonella. `Consumption of products containing Salmonella can cause serious and sometimes fatal infections in young children, frail or elderly people and others with weakened immune systems. Healthy persons infected with Salmonella often experience fever, diarrhea (which may be bloody), nausea, vomiting and abdominal pain. In rare circumstances, infection with Salmonella can result in the organism getting into the bloodstream and producing more severe illnesses such as arterial infections (i.e., infected aneurysms) endocarditis and arthritis. Disclosure: I am/we are long MKC.